A controversy erupted over the weekend after local comic book fans discovered that Indonesian illustrator Ardian Syaf, one of the country’s most revered comic book artists who has drawn iconic superheroes for both Marvel and DC, had snuck references showing his support for the protests against Jakarta Governor Basuki “Ahok” Tjahaja Purnama into the first issue of the new “X-Men Gold” series. After the story was reported on by several comic book news websites, Marvel Comics issued a statement saying the references are “in direct opposition of the inclusiveness of Marvel Comics and what the X-Men have stood for since their creation”, that they would be removed from all future issues and versions of the comic, and the Ardian would face “disciplinary action”. It was not clear at the time what the comic book company meant by that, but based on this post on his personal Facebook page, it looks like his actions, as well as his unrepentant attitude towards his unprofessional behavior, may have cost him his life’s work. In this last chance, I want to tell you the true meaning of the numbers, 212 and QS 5:51. It is number of JUSTICE. It is number of LOVE. My love to Holy Qur’an…my love to the last prophet, the Messenger…my love to ALLAH, The One God. My apology for all the noise. Good bye, May God bless you all. I love all of you. Ardian did not elaborate any further on what he meant by his career being over, but considering the widespread condemnation he has received throughout the international media, it seems fair to speculate that no other mainstream comic book publisher is likely to want to hire Ardian after this. 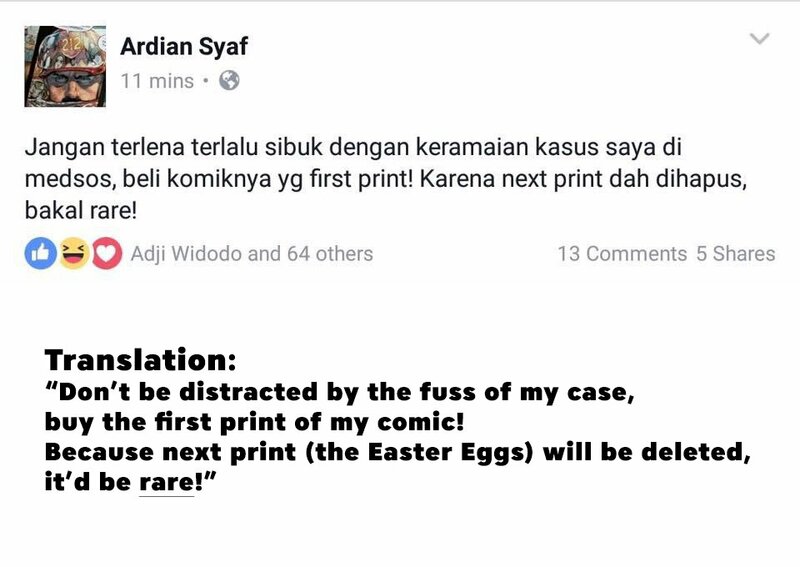 The illustrator had previously indicated the controversy was not a big deal and flippantly suggested his fans get their hands on the first printing of the issue since it will become a collector’s item (screengrabs and translation by Reddit user Kinda1994Guy, who was instrumental in bringing Ardian’s actions to Reddit and the media’s attention). He also posted this “apology” on his Facebook page, but deleted it fairly soon after. Obviously, Ardian sees himself as a martyr for his faith (and judging by the many supportive comments on his “career over” Facebook post, he has many supporters in Indonesia who agree). But if his career as a comic book artist is truly over, then it is first and foremost because of his unprofessional behavior, which many have noted put not just his career but also that of other Indonesian and Muslim artists in the comic book industry at risk. As for Ardian saying that the numbers of the anti-Ahok movement he referenced in the comic represent “justice” and “love”, we’ll refer you to another comic book creator, G Willow Wilson, who is one of the creators of Marvel’s most popular Muslim superhero, Ms Marvel, and a Muslim herself. She wrote an excellent and scathing condemnation of Ardian’s actions, including a thorough critique of the particular interpretation of Quranic verse Al-Maidah 51 used by Ahok’s political enemies. But it seems neither hers nor any of the other criticism and repercussions Ardian has received have caused him to question his own moral righteousness. Perhaps that will give him some comfort as he looks for a new career. No Ardian your career as cartoonist is not over. Rather time has come for you to move.on to a higher level. May Allah always be with you where ever you go brother!